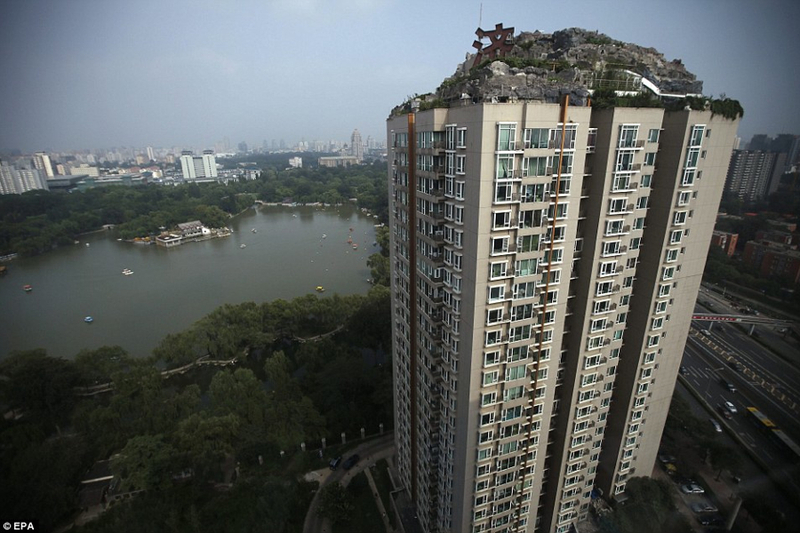 There's something rather poetic about Professor Zhang Lin's mountain villa sitting on top of a 26-story apartment building in Beijing's upscale Park View estate. Instead of going for the box inside a box option with a view, he decided to build a mountain in the sky, surrounded by nature. Could it be a form of protest against the trend to build smaller and more compact homes disconnected from nature? A sign of a future trend? It apparently took 6 years for Zhang to build his dream home, without a permit or a cease and desist notice. But now it looks like he might have to demolish his home in 15 days or it will be demolished for him... I think taking 15 days to demolish something that took 6 years to build should be more of a concern for the residents beneath the mansion at this point. How are they going to demolish this safely? Zhang's mansion is an interesting solution to a growing concern many people have when it comes to living in apartment buildings in the city : "How to make it fit my needs and suit my lifestyle better ?" Instead of people having to adapt to a uniform building plan, the building should to adapt to people's lifestyle. People's lifestyles are so diverse yet the plans for their apartment are so uniform. There's also the need to reconnect to nature and green roof are just the beginning. A usable green space, such as Zhang's mountain, on the top floor might be the next level. The concept of a mountain above the building itself is as an interesting challenge for structural engineers. I'm sure there's a way to make this work and I do see the incentive for someone with the means to want to live more comfortably in a compact city like Beijing. This might be a glimpse of what will happen in the future of apartment buildings as more and more people will want to live comfortably in the city and bring more of nature around them. It will be interesting to see how this develops.